This may not be your typical Easter cake, but Hershey Bar Cake is the perfect post-Easter cake because you can make it with leftover milk chocolate eggs or chopped up chocolate bunnies! Or you could just do it the old fashioned way and use actual Hershey bars. Whatever type of milk chocolate you use, the result is a very, very moist milk chocolate cake. The key is not just the melted milk chocolate, but the addition of chocolate syrup and buttermilk. There are many different versions of Hershey Bar Cake due to the fact it’s an old recipe and the size of Hershey bars has changed over the years. Some versions call for up to 8 bars, while others call for six. The amount of sugar also varies with some recipes containing up to 2 cups and others calling for less. Having tried the 2 cup version, I recommend the more recent version from the Hershey’s Test Kitchen which uses 6 bars and only 1 1/4 cups sugar. It’s a bit less sweet, so you can top it with a drizzle of icing (I used cream cheese on this one) without making the whole thing too sweet. 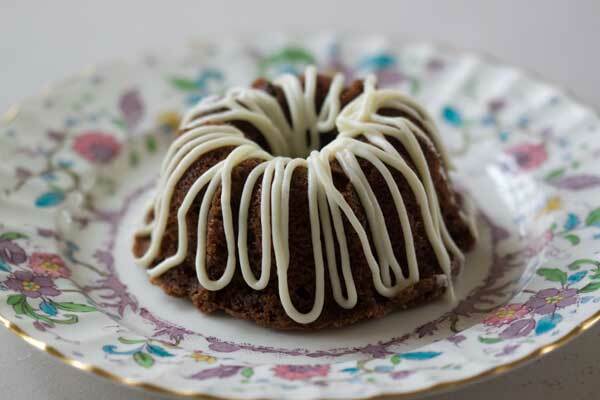 Below is the full version of the recipe, but if you have a small family or just want to make it for yourself and a few friends, you can quarter the recipe and make it as mini Bundts. My mini Bundt pan is an old one from Nordicware. It’s similar this the 65th anniversary mini Bundt pan sold at Williams Sonoma, but black, so I have to reduce the heat to 325F. But no matter what color your mini Bundt pan is, you probably can’t go wrong using a lower and slower temperature. Preheat oven to 350 degrees F. Grease and flour a 10 inch tube pan or 12 cup Bundt pan or about 16 mini Bundt pans. In a large mixing bowl, beat butter and sugar until light and fluffy. Add eggs, one at a time, creaming well after each addition. Add vanilla and melted chocolate. Mix together the flour, baking soda and salt. Add flour mixture and buttermilk alternately, beginning and ending with flour mixture. Stir in the chocolate syrup. Bake 1 hour and 20 minutes, or until cake tests done. Cool in pan 10 minutes. Turn out onto wire rack and let cool completely. If making mini Bundts, bake for 25 minutes at 325F. Drizzle with cream cheese icing or just dust it with powdered sugar. This looks absolutely delicious! My mom makes a similar cake, but I’ll have to try this one out myself. The recipes on here are great! I’ll be making a bunch of these recipes when I move into my apartment in the fall and I have my own kitchen to bake in. You could also try throwing in some marshmallows into this batter. I’m sure it would be delicious! I bake marshmallows into brownies all the time and it comes out great. Keep the recipes coming! I haven’t made a Hershey’s Bar cake in a very long time! Yours looks yummy. There’s something about the white and dark contrast that always gets me. Looks absolutely divine! Jan, I just some of my leftover German Buttercream Cream Cheese Icing from a recent post. I didn’t want to focus on that because you can use any type of icing you want. Since I’m all thumbs with decorating, I just used a writing tip and squeezed icing all over it. If you don’t have a tip you can use a freezer bag with the bottom corner snipped off. Hope that helps! How did you do the icing? What tip? Cream cheese? It looks wonderfully tempting. Thanks Anna! We made some milk chocolate mini bundt cakes with TWD-BFMHTY a few years ago. They were fun and good, and sound like a perfect idea for all the Easter candy. It looks beautiful, especially on that pretty plate.